Cash burning by indian ecommerce start ups have witnessed a new record.During the Holiday season between September and December, the cash burn—the amount companies spend to run their businesses—is reached up to $400 million, according to research firm RedSeer Consulting. Flipkart, whose cash reserves have gone up to more than $4 billion after SoftBank, Tencent Holdings and eBay put around $2.8 billion into the company in 2017 , thinks now that profitability is not the highest priority right now and its more about creating a marketshare.Flipkart’s CEO Kalyan Krishnamurthy said Amazon India’s cash burn has been three times higher than that the Indian ecommerce giant,and despite the massive spending,Flipkart was ahead of Amazon. Krishnamurthy, who took over the reins as the online retailer’s chief executive a year ago, told TOI in an interview that Flipkart was the most disciplined consumer internet company in the country, having brought down its cash burn by 50% in the last year. Generally Festive season sales make for a huge share of the total annual sales in segments like apparel, consumer goods, and home decor. So companies go on massive advertising spends during this time in the name of great indian shopping festivals. Earlier, Flipkart had halved its monthly spend to USD 20 million from USD 45 million and also succeeded in raising its biggest-ever funding round of $2.5 billion.Flipkart's monthly cash burn right now is about Rs 260 crore ($40 million).Compared to that Amazon India is losing about Rs 600 crore per month as it eyes market leadership. So where does the cash go?A bulk of it goes on discounts as Indians are among the most price sensitive when it comes to ecommerce .In India massive discounting have been key to garnering volumes when it comes to online shopping. 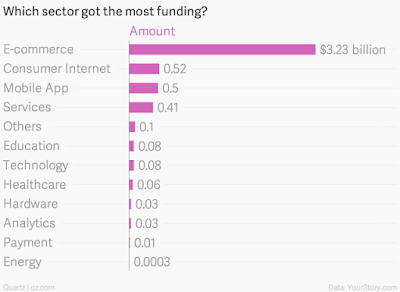 According to a recent report by Goldman Sachs, 30% of an Indian e-commerce company’s expenses go towards discounts. The one area where spending is seen flat or marginally lower this year is advertising. For companies are now increasingly spending on low-cost channels such as digital marketing.Amazon is believed to have spent almost $1billion last year in India after launching its popular subscription service Prime at a discounted rate, which offers faster delivery and a digital entertainment platform. Amazon registered its highest international losses ever at $936 million for the quarter ending September 30 last year, largely due to India spends. 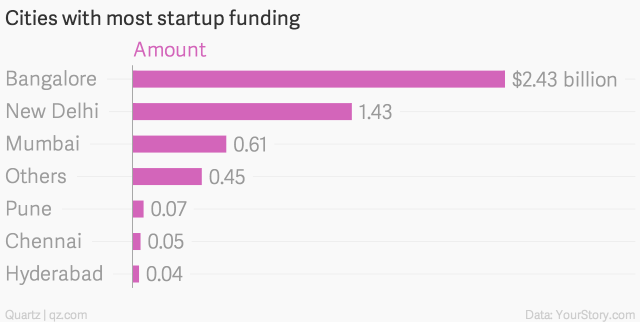 According to Flipkart CEO “Its competitors are burning 2.5-3 times more money than us.  I don’t even know how they get by with this. Despite that, we stand at least 40-50% bigger than the second player in the market,” he said, directly taking on Amazon, which has spent more than $2 billion in India since starting operations here in 2013. However the question that needs to be asked to Mr Krishnamurthy of Flipkart is why did it take the company till its recent funding to understand the importance of increasing its marketshare rather than focus on profitability “Few months ago, Flipkart was not talking like this. The reason is, they have excessive funds now and it is in direct competition with Amazon. By burning more cash they want to retain more market share, said Satish Meena, forecast analyst at Forrester Research to Entrackr. "However he added "Excessive burn will not give kind of scale you are looking for. Because there is time factor for consumers as well. 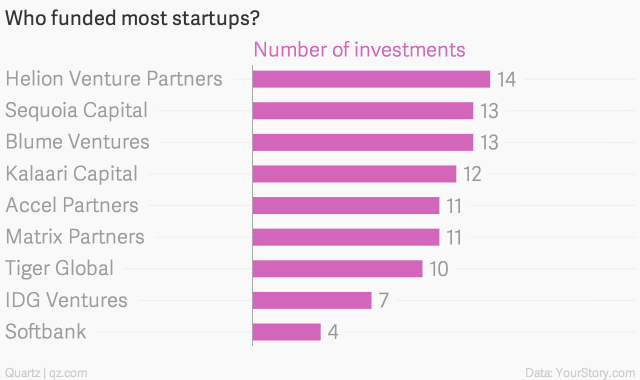 Flipkart should invest more in infra and generate customer loyalties"
According to a report from Quartz Flipkart prior to the funding coming in, had reduced its monthly burn to about $20 million last year, but increased its spends during the festive season discounting in categories like smartphone to shore up sales. “We did a lot of work in 2017 to reduce the burn, which is at a very healthy level. We are not going to do anything drastic to cut down on anything else to optimise on burn,” Krishnamurthy said. But profitability is not something the company is actively looking at this year. Meanwhile The world’s largest e-commerce firm Amazon has attacked Bangalore based research firm RedSeer Consulting on its India ecommerce sale rankings which have shown that Flipkart led the last week’s 5-day festive sales with a 58 percent market share in the gross merchandise value of goods sold. The Indian e-commerce market, which has 20 million monthly active customers, is expected to grow 2.5 times this year on the back of categories other than smartphones.However indian ecommerce companies needs to come out of this " obsession with marketshare" very soon and show investors a truly sustaining model that is based on a strong revenue model based on the ability to make money for investors. Flipkart bears daily losses of over Rs 14 crore in the last financial year as it fought to stave off competition from arch-rival Amazon in one of the world’s fastest growing markets for online retail. The company spent aggressively to attract talent and customers thereby increasing losses. 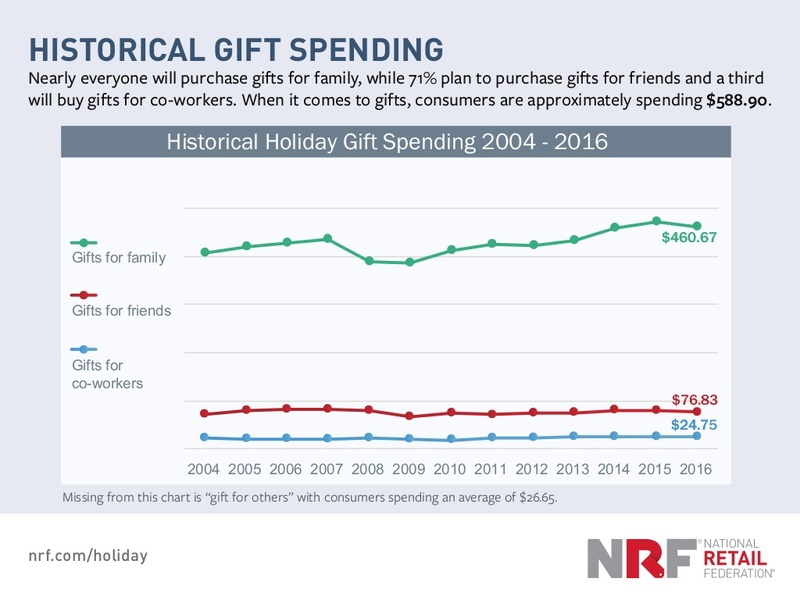 Despite thousands of store closings this year, Americans supplied a final flurry of spending to give retailers their best holiday season sales since 2011, figures released Tuesday show. 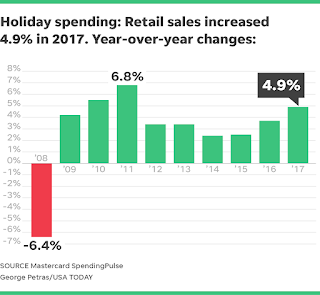 U.S. year-end holiday retail sales rose 4.9% compared to the same period last year, a welcome gift to U.S. retailers amid new signs of consumer confidence. Online retail shopping similarly increased 18.1%, while overall consumer buying during the holiday period set a record for dollars spent, according to the sales report issued by Mastercard SpendingPulse. The holiday shopping season, a crucial period for retailers that can account for up to 40 percent of annual sales, brought record-breaking online and in-store spending this year of more than $800 billion, according to Mastercard Inc’s analytics arm.According to the report, last-minute shoppers were largely responsible for a 5.9 percent increase in jewelry sales. 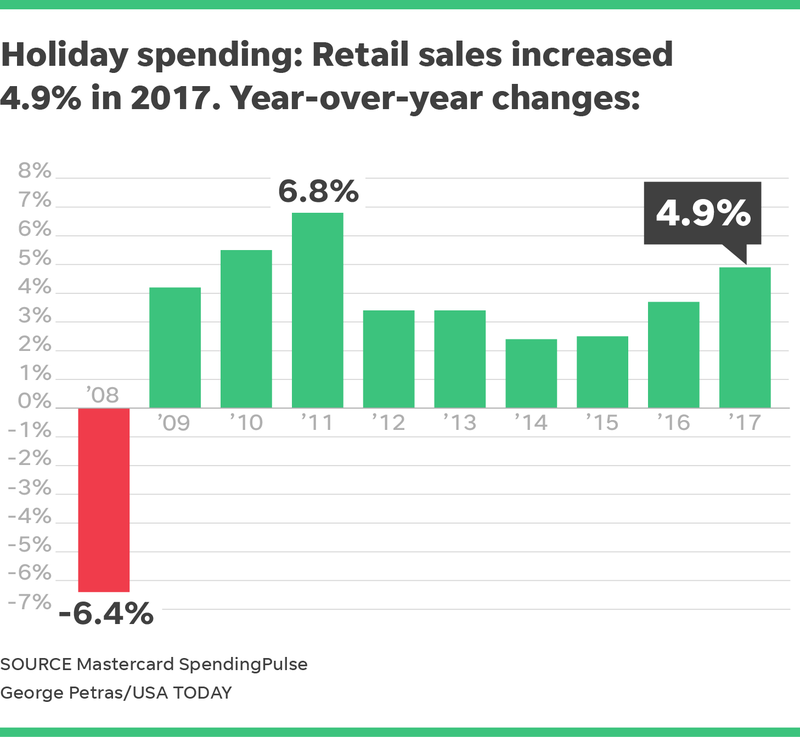 Some retail categories saw higher increases than others: There was a 7.5 percent increase in sales of electronics and appliances this holiday period, the largest jump in the past decade. 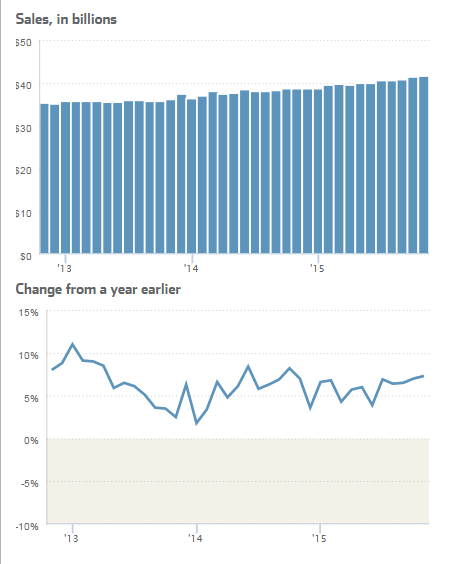 Sales in the home furnishings and home improvement categories each jumped 5.1 percent. There were moderate increases for specialty apparel and department stores, despite a lackluster year overall that saw thousands of brick-and-mortar store closings. However, the women’s apparel category was negative over the entire year, according to Mastercard data.The findings were based on aggregate sales activity in the Mastercard payments network, along with survey based-estimates for other forms of payment, including cash and checks, The data exclude auto sales. was no place like home for the holidays for many shoppers, who sent sales of electronics and appliances up 7.5%, the strongest growth of the last 10 year. Sales of home furniture and furnishings separately grew 5.1%. A host of traditional retailers and department store chains topped the table of the biggest stock market climbers on Tuesday, helping the S&P 500 retailing industry index gain 0.6 per cent and achieve a fresh record high.In another sign of the overall sector's strength, a public index launched in mid-November to track the performance of traditional U.S. retailers showed a nearly 15.7% increase in market returns as of Friday.The Solactive-ProShares Bricks and Mortar Retail Store Index is composed of U.S.companies that account for 75% or more of retail revenue from in-store sales, including Macy's; Costco; Best Buy; Home Depot; Tiffany; Target; Dollar General; Barnes & Noble; The Gap; Sears; Nordstrom; AutoZone; and JC Penney. 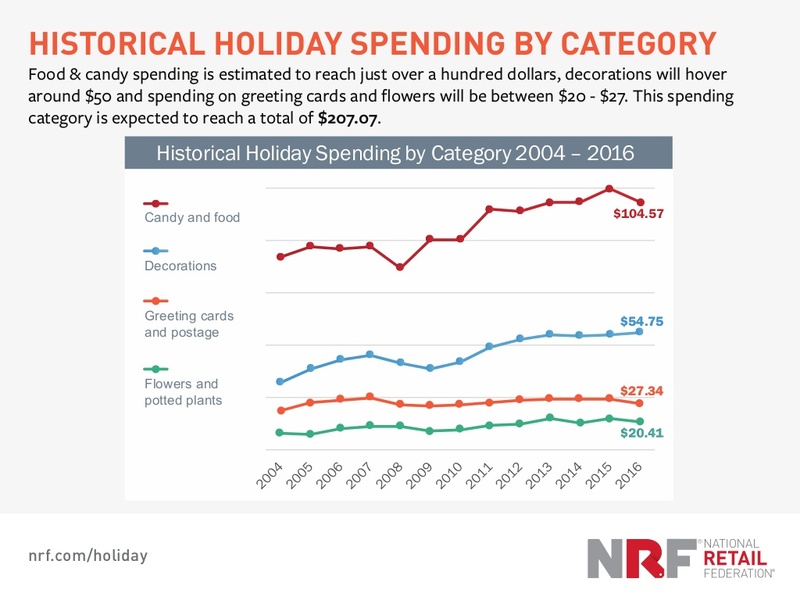 The National Retail Federation said it would not have its own data ready until mid-January — but predicted final holiday retail sales figures would meet or exceed its October forecast of an increase of 3.6 to 4 percent.United Parcel Service Inc, the world’s largest package delivery company, said on Wednesday it was on track to return a record number of packages this holiday, having handled more than 1 million returns to retailers daily in December. That pace is expected to continue into early January, UPS said, and would likely peak at 1.4 million on Jan. 3, which would be a fifth consecutive annual record, up 8 percent from this year. Amazon just had one of its most spectacular sales history, as it announced that it has sold more than 1 billion items from small businesses and entrepreneurs worldwide during the period from Thanksgiving to Christmas season. In a statement released Tuesday, Amazon said it has sold "tens of millions" of Echo devices worldwide, with Echo Dot and Fire TV Stick with Alexa Voice Remote being the most popular products in Amazon across all categories. It is just the day after Christmas that Amazon is celebrating its "biggest" holiday sales surge "with customers all around the world shopping at record levels." The company's popular product, Amazon Alexa, which is a voice-based assistant software behind Amazon Echo, was the most downloaded app on Christmas Day in both Apple Store and Google Play, two virtual stores for the iOS and Android mobile operating systems. 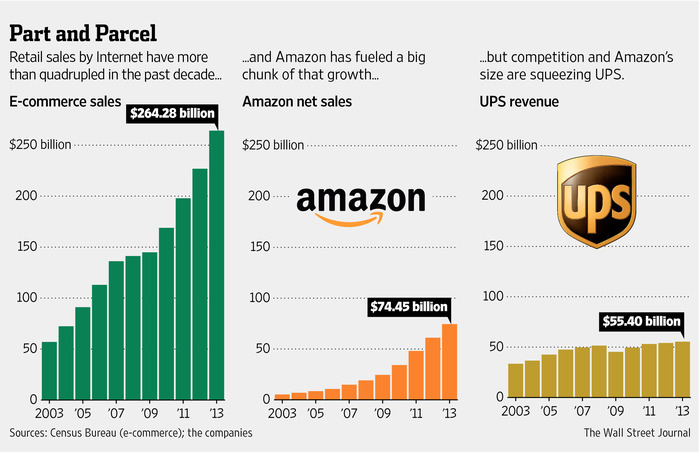 Amazon is said to have delivered 1 million customer packages in a single day across its 10 North American and European fulfillment centers. Over the course of one week, more than 4 million people became Prime members or started a free trail, sending the e-commerce giant's membership count to new highs.Amazon now represents close to 4 percent of all retail sales online and off in the U.S., according to eMarketer. E-commerce sales will increase 15.8 percent to $452.8 billion by the end of 2017, according to the research firm’s estimates. 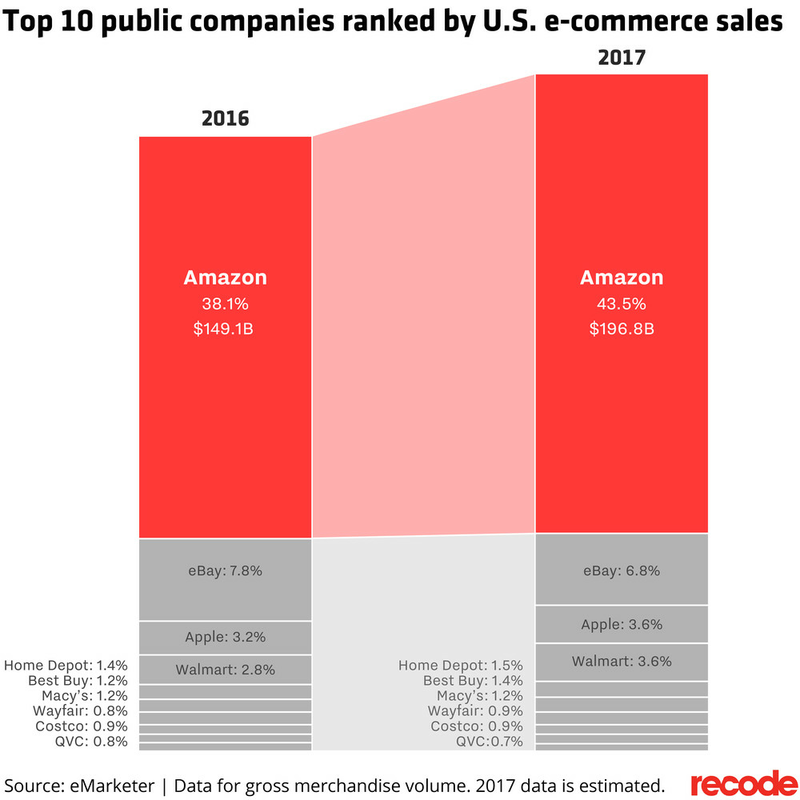 Meanwhile Amazon’s e-commerce sales are expected to grow 32 percent to $196.8 billion dollars in 2017 in the U.S., or 43.5 percent of total e-commerce sales. 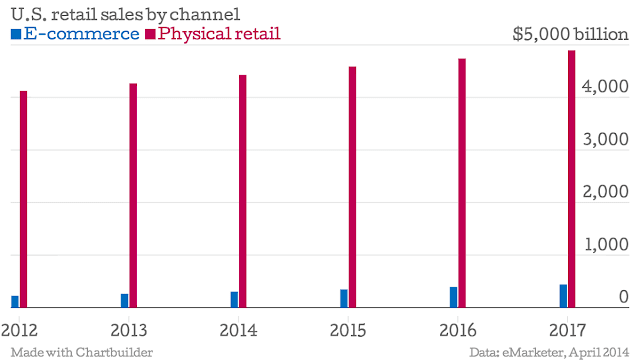 These figures represents gross merchandise volume data, which includes sales made by third parties on Amazon’s marketplace.The widening gap over the past year between Amazon and so-called store-based retailers is particularly striking. It's important to note that Amazon still only boasts a 5 percent share of total retail sales, excluding food, across the country, according to data from the U.S. Census Bureau. 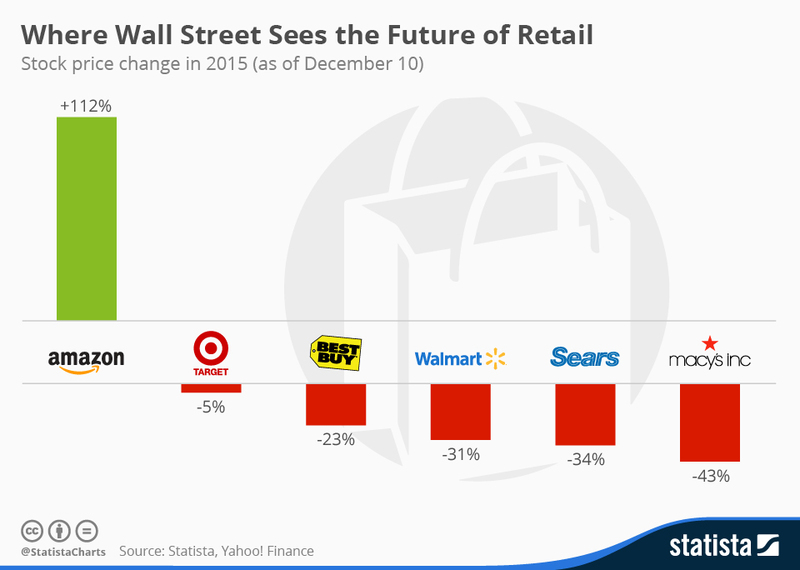 But this is coupled with big names in the retail space — Wal-Mart, Costco, Home Depot, Target — seen as losing market share as their margins shrink and dollars shift back to Jeff Bezos' company, the analyst added.Amazon, essentially, is "eating the retail world," MKM Partners analyst Rob Sanderson recently wrote a note to clients. 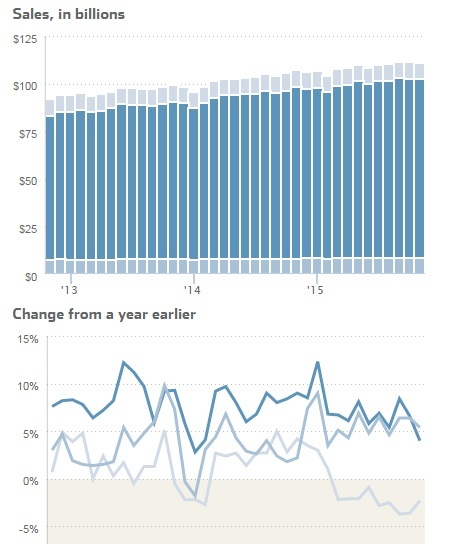 His chart shows Amazon, in the categories that the company serves, growing its market share, as brick-and-mortar retail sales are on the decline Amazon held 38 percent market share, or $149 billion in sales, in 2016, and it remains the biggest e-commerce company. 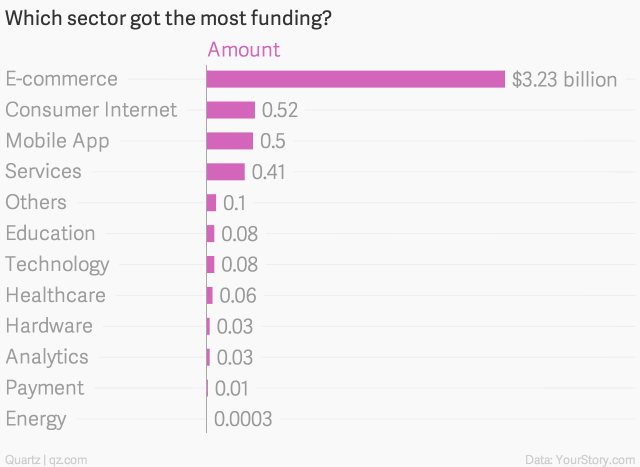 It is followed distantly by eBay, Apple and Walmart. Online grocery shopping is expected to grow five-fold over the next decade, with American consumers spending upwards of $100 billion on food-at-home items by 2025, according to a recent report published by CNBC. Supermarket giants such as Wal-Mart Stores and Kroger already draw sales from their online efforts and compete with Amazon and other e-commerce challengers, but the report from Food Marketing Institute and Nielsen points out that the online channel is likely to capture significantly more market share in the decade ahead from the bricks-and-mortar stores. However as of now Customers are buying generic brands more than ever in stores, but they're not buying as many online. For now, at least. Last year, trips to a brick-and-mortar store that included the purchase of a private-label product grew 1.1 percent, according to Nielsen. Online, that number fell 1.7 percent. However, just 12 percent of shoppers bought groceries online at some point last year, according to Cowen and Co.
Amazon recently pulled the plug on its online food delivery service Fresh in a number of areas across nine states in the United States. The decision was apparently blamed on the failure of the postal service to deliver the perishable goods on time, or in some cases, at all. While the service is also offered in cities abroad such as London, Berlin and Tokyo, as analysis from Kantar Worldpanel shows, the Seattle-based company and others like it have an awful long way to go if they are to make a meaningful dent in the market share still held by traditional bricks and mortar grocery stores. As a share of all FMCG revenue in the U.S., e-commerce still accounts for only 1.5 percent. 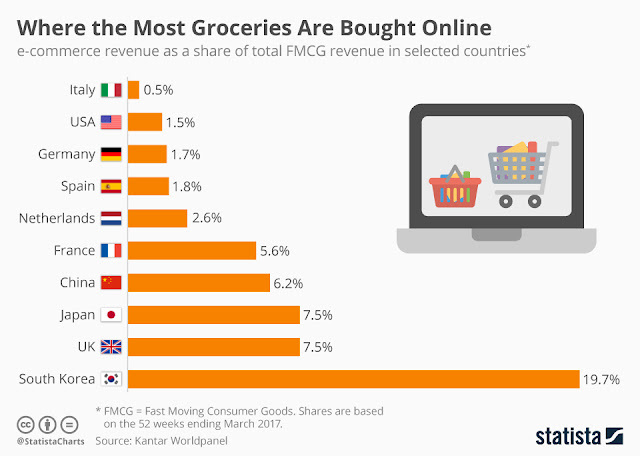 In comparison Meanwhile South Korea towers above all of the nations when it comes to online grocery shopping with grocery shopping in the region accounting 19.7 percent. Having seen a 40 percent increase in online grocery spending last year, the country is the world leader, and by a big margin. 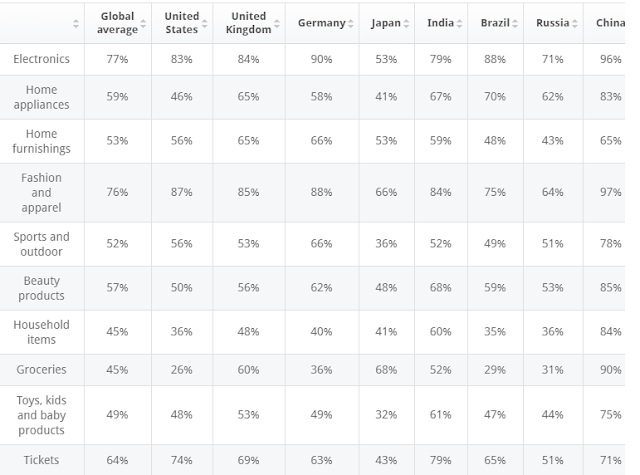 In joint second place, with a whole 12.2 percentage points less, are the UK and Japan. FMCG e-commerce has long been on offer to consumers in the UK and is very much a mature market, with penetration growth slowing over the last few years. South Korea, on the other hand, is still going from strength to strength. Data from Adobe shows that Thanksgiving online sales hit a record, whopping $2.87 billion, up 18.3 percent on a year ago and surpassing Adobe’s own prediction of $2.79 billion. 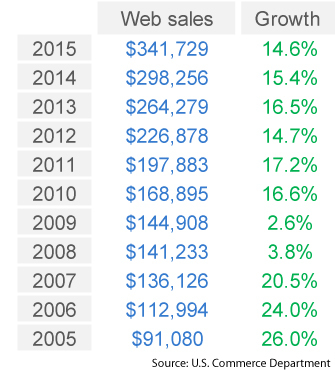 This is a huge spike in online sales for the day. As a point of comparison, in 2016, Thanksgiving sales totalled $1.93 billion. Given that these early days of holiday sales are seen as a bellwether for the rest of the season — a crucial part of the year for e-commerce companies — it’s a strong sign of a tipping point in online spending, and also of consumer confidence. 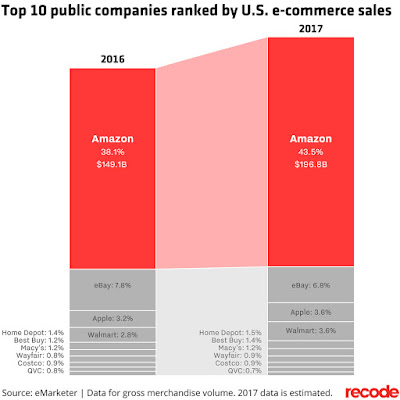 Adobe determines its figures by tracking 80 percent of online transactions at 100 of the largest retailers on the web in the U.S. 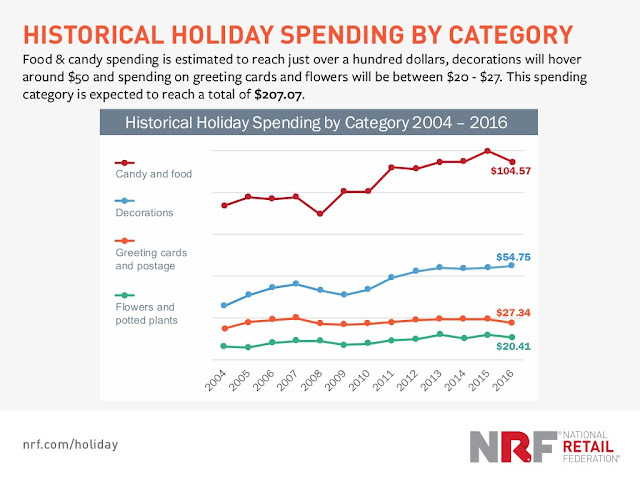 Shoppers racked up $1.3 billion in sales in the afternoon (our previous figure was $1.52 million spent online as of 2pm Pacific time on Thanksgiving Day). 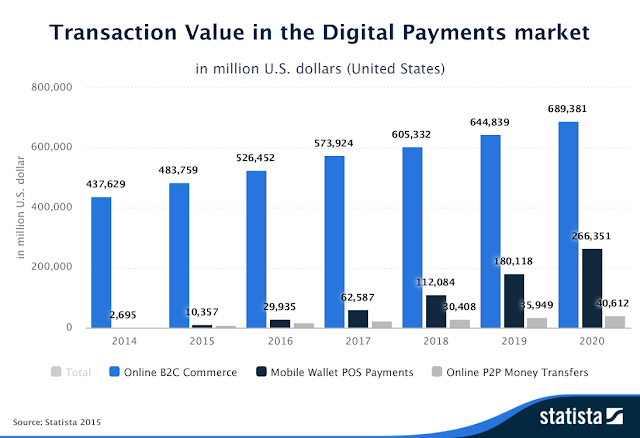 Smartphones were accounting for just under half of all e-commerce traffic, at 46 percent.Shoppers have spent $640 million online Friday as of 10 a.m. 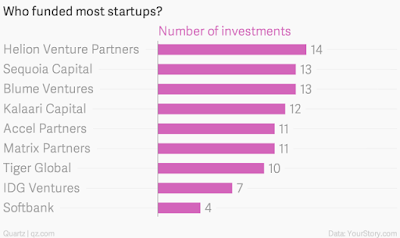 ET, up 18.4 percent from last year, according to Adobe Analytics. Adobe tracks 80 percent of online transactions at the top 100 U.S. retailers.On Thanksgiving evening, up until 5 p.m. 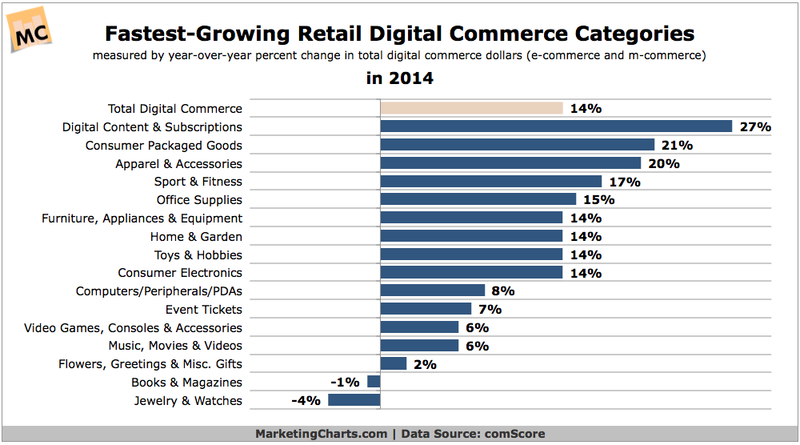 ET, shoppers spent more than $1.52 billion, up 16.8 percent. Cyber Monday, the Monday after Thanksgiving, is expected by the data tracker to be the largest online shopping day in history, with an expected $6.6 billion in sales. In all, online holiday spending is expected to generate $107 billion in sales, an increase of 14 percent. Adobe says the average order value on pre-Thanksgiving day is, as of 2pm Pacific, $132, down from $137 earlier in the day. As a point of comparison, IBM’s Bluemix analytics panel has been putting the average order value currently at around $114 today. One reason for the decline in average order value is the laying on of more discounts as the day goes on: these may mean more volume, but overall less spent per item. It seems Brexit will be unable to stop the rapid growth of digital media in the United Kingdom.Strong demand for digital advertising in UK’s advertising market is a reminder to the fact that for the moment at least—the industry is shrugging off concerns about the impact of a potential Brexit.This year, 2016 digital ad spending in the UK is expected to grow by 12.0%. That compares to 31.1% growth in net digital ad revenues at Facebook, 13.9% growth at Google and 13.2% growth at Twitter.UK total digital adspend grew 16.4% in 2015 to over £8.6bn with the average home now owning 8.3 internet devices.All 3 biggest internet giants Facebook, Twitter and Google are set to outpace digital advertising growth in the UK in 2016, according to research from eMarketer. Reports indicate Google will net £3.80 billion ($5.81 billion) in ad revenues—accounting for almost 40% of all digital ad spending in the UK). With Facebook a clear leader in digital advertising, it remains to be seen whether there will be a knock on effect after it was found to be overstating the average view times on its video content from between 60 to 80 per cent for the last two years. Nonetheless, it is predicted that it will net digital ad revenues of £1.19 billion due to alterations made to its mobile video formats, new ads in mobile newsfeeds and a new suite of Instagram ad formats. Twitter on the other hand received a significant downgrade, set to grow by about 14 per cent generating around £153.5bn, down from previously predicted growth of 31 per cent although rumours of a new buyer can breathe new life into the network.The amount of time UK adults spend consuming digital content continues to rise with consumers spending an extra 25 minutes a day on digital devices in 2016 compared to last year, according to eMarketer’s latest forecast. This means that in 2016, UK adults are expected to spend 9 hours and 47 minutes consuming media compared with 9 hours and 26 minutes last year—a 3.7% rise.In 2016, digital media consumption will pass a milestone, accounting for just over half (50.07%) of total media consumption in the UK for the first time. When it comes to eCommerce UK, US and German consumers spend the highest amount per person online worldwide, according to research compiled by Internet World Germany.British shoppers spend the most - an average of £1,050 each year, followed closely by the US with £1,001. 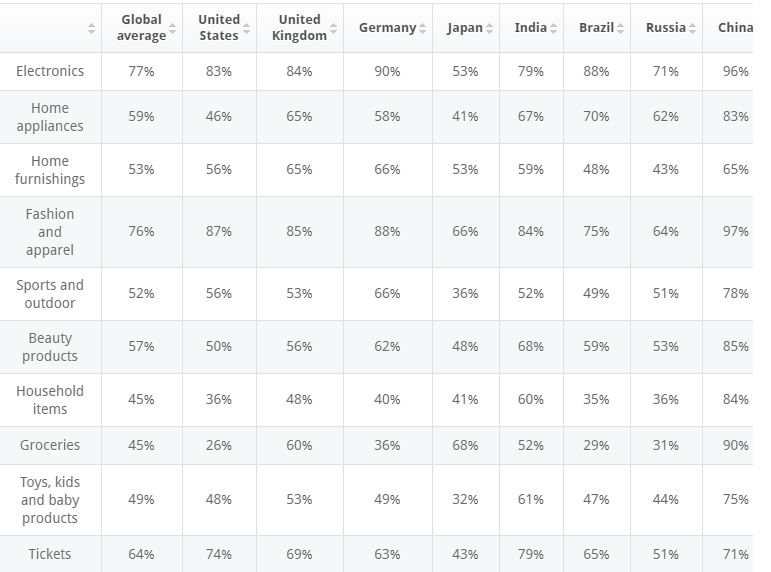 German consumers take the third spot, with online shoppers spending £915 on average per year. The kindle stick allows Tens of thousands of TV episodes and movies, from Amazon Video, Netflix, BBC iPlayer and more, plus games, music and apps. 8 GB of storage and 1 GB of memory, plus a dual-core processor for fast streaming and smooth performance. However its not all good news for Tablet manufacturers SA new report published by IDC shows that worldwide tablet shipments have shrunk for the first time since 2010. 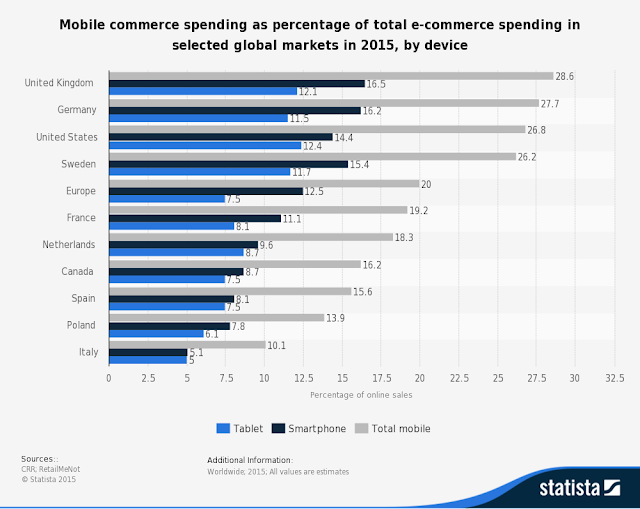 In fact the cross pollination of online retail with brick and mortar retail has only made the physical retailers more aware and savvy about using digital and mobile strategies to improve in store shopping,targeting the consumers using gps enabled technology to push mobile alerts and messages across users smartphones. However !It now seems that wall street has decided and finally given it a thumbs up to the online retail industry and specially Amazon. The company dominated Black Friday sales in the United States and is all but certain to be the number 1 source for last minute presents for many million people around the world. Amazon’s stock price more than doubled this year, bringing the company’s market cap to more than $300 billion. In contrast Wall street has given the brick and mortar retailers like Best Buy and Walmart a pass, and almost all of them has seen their stocks massacred and crumble in 2015 as they struggle to break Amazon’s dominance in the online world. digital content and subscriptions are growing the fastest with 27% growth, while in terms of products, consumer packages goods have been showing the fastest growing eCommerce segment with 21% growth followed by apparels and accessories sports and fitness wear are among the fastest growing online categories, followed by office supplies, home appliances and furniture.